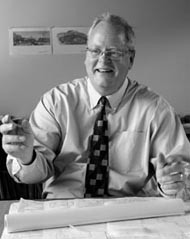 Gary Johnson, AIA received his architectural training at Harvard University and has practiced for more than twenty years. Early in his career Mr. Johnson built a portfolio of artistic commercial interiors, small building projects, and lectured about his work at national design conferences. Over the past ten years, he has been involved in large scale office buildings, convention centers, retail, mixed-use, multi-housing and international projects. At PDI World Group, Mr. Johnson helped win a design competition in 2006 for a 100,000 SM condominium project in Seoul, Korea. Mr. Johnson served as president of PDI during which time he was involved in marketing, managing and design efforts in Korea, China, UAE and Europe. In 2009 with the support of PDI he launched Aventūr for pursuing projects in Europe and South America. In 2010, Gary Johnson won the design contract for the prestigious Escola Americana do Rio de Janeiro to be constructed in Barra Tijuca, the district which will host the 2016 Olympics. Prior to studying architecture, Gary Johnson lived in London, Oslo and Paris developing a portfolio as a young artist. His artwork was acquired by numerous corporations and museums including the Museum of Modern Art and Metropolitan Museum of Art in New York, Fogg Museum at Harvard, Biblotheque Nationale in Paris, Smithsonian Institution in Washington DC, and the Minneapolis Institute of Arts.